Bending forward to the ground and straightening back up is an activity that most of us do repeatedly during the day without ever giving it a second thought. However, if you are one of the many people who have ever experienced low back pain or a hamstring injury, chances are you are far more aware of how injuries to these areas can affect this simple daily activity. Muscular low back pain and hip extensor (particularly hamstring) injuries are very common. For that reason, it is valuable to understand the mechanics of how these two regions work together when doing the simple activity of bending forward and straightening back up. 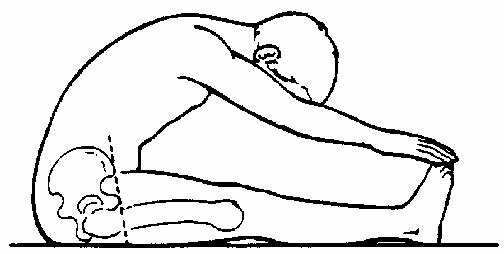 In the process of bending forward from a standing position there is a simultaneous action of trunk flexion and hip flexion. The trunk flexion occurs mostly in the lumbar region because there is much more available range of motion for flexion in the lumbar region than in the thoracic region. As you bend down gravity is attempting to pull the torso toward to the ground. This motion is checked first by eccentric contraction in the spinal extensor muscles such as the erector spinae. 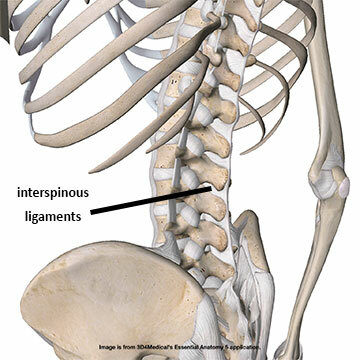 As you get closer to the end range of motion, the eccentric activation of these muscles is helped by the elastic extensibility of the posterior spinal ligament structures such as the posterior longitudinal ligament as well as interspinous and supraspinous ligaments shown below. At the same time trunk flexion is occurring, the pelvis is rotating anteriorly on the femoral heads. The anterior rotation of the pelvis is producing hip flexion. When bending forward toward the ground this motion is checked by eccentric activation of the hip extensor muscles such as the gluteus maximus and hamstrings. 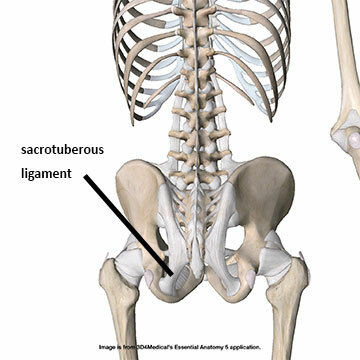 At the end range, motion is also checked by tautness in the sacroiliac ligament complex as well as the sacrotuberous ligament, which has a fascial continuity with the hamstrings (shown below). When returning from the forward bent position, there is a mechanical disadvantage to overcome. The lumbar extensors and hip extensors work together simultaneously to lower you down into this position. However, initiating the return to a standing position is usually too much effort for the lumbar extensors in the early stages of the movement because these muscles are not meant for lifting heavy force loads. Therefore, the hip extensors will initiate the posterior pelvic rotation (hip extension) until the trunk is in a better position to concentrically engage the spinal extensors without over stressing them. 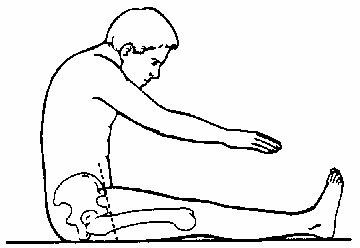 The motions and forces described here are specifically related to what happens when you attempt to bend over from a standing position. Keep in mind that you can perform the exact same motion from a different position and the muscles and soft tissues recruited for that process will be different. For example, if you are in a supine position to begin with and attempt to reach toward your toes (like in the sit and reach test), you are performing the same motion as bending forward from a standing position. The corresponding joint mechanics are the same, but the muscles recruited to perform that action are quite different. The trunk flexion is controlled by concentric contraction of muscles such as the rectus abdominis, abdominal obliques, and iliopsoas. The hip flexion is produced primarily by concentric activity of the iliopsoas and the rectus femoris. Another reason it is valuable to look at the lumbopelvic rhythm is to understand flexibility limitations and where your massage and stretching techniques should be aimed. Limitations in ability to reach the toes may involve either the lumbar region or the hamstrings. 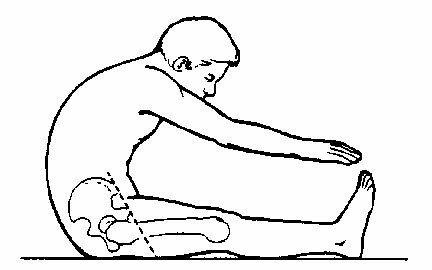 For example, here is an individual reaching toward the toes with an equal degree of flexibility in the lumbar and hamstring regions. Next we see an individual who has limited ability to reach the toes due to tightness in the lumbar region. And finally, a person who is unable to reach the toes due to hamstring tightness. This highlights how important this relationship of the lumbar and hamstring regions is for proper lumbopelvic rhythm.